The food is decent and worth for money. The ambience is also good. Service is bit slow though. Good for casual dining. 2,4,6-8 sitting arrangement (table settings). Calm and friendly staff,Budget food. Opposite to CST railway station/bus stand cst terminus. 300 meters approx from platform. This is a restaurant located just opposite Mumbai CST railway station. They serve Indian and Chinese cuisine. Veg and non veg options are available. We liked soup,noodles and chicken biryani. Ambiance is nice and staff is prompt. Great place. Good food. Try Basmati ki Khushbu, best dishes. Best staff here, they are very friendly and helpful. Awesome. 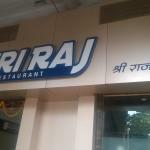 Been to Sri Raj Restaurant? Share your experiences!